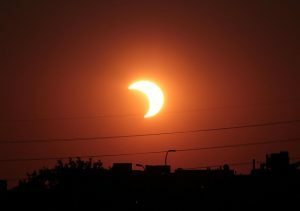 A solar eclipse is one of nature’s grandest spectacles and one is scheduled to cross the U.S. on Aug. 21. For a few minutes, the sun will go dark with a halo of light around it, the temperature will fall, and beautiful sunset colors will encircle the entire horizon. During the event, the sky looks like it has a hole punched in it and planets often pop into view. In ancient times, an eclipse was one of the last things anyone wanted to see. Many cultures had stories of demons or creatures attempting to eat the sun and rituals were created to ward off the invaders. Even today, people are mesmerized by the sight of a solar eclipse, with some scientists becoming so enthralled that they forget to carry out their experiments during those crucial minutes. Depending on where you are situated geographically, you will be able to see either a partial or total solar eclipse on Aug. 21. A total solar eclipse begins with the moon gradually encroaching on more and more of the sun in a phase that can last as long as 90 minutes. The sun being totally blocked by the moon will last less than 3 minutes in 2017. Partial solar eclipses are visible over a much larger area than total eclipses. Viewing a solar eclipse is an event you will remember for a lifetime. You can safely enjoy the view, but it is vital that you protect your eyes at all times. By following a few simple rules, you can experience the eclipse without harm. During a solar eclipse is a dangerous time to look at the sun without protection. The only safe way to look directly at the uneclipsed or partially eclipsed sun is through special solar filters. Homemade filters or ordinary sunglasses are not safe for looking at the sun. The safety experts at NASA have released a list of rules for safely viewing a solar eclipse. It is recommended that you use “eclipse glasses” or hand-held solar viewers to watch the solar eclipse. Stand still and cover your eyes with the device before looking up at the sun. If you wear eyeglasses, keep them on and put the device on over them. When the eclipse is over, you should turn away to remove the device, because it is dangerous to remove it while still looking at the sun. If looking at the eclipsed sun through a camera, telescope, binoculars, or other optical device, a solar filter must be attached to the front.